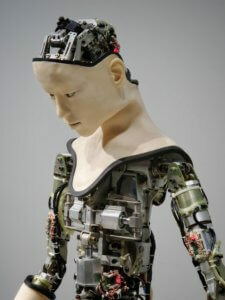 In principal training is receiving enough of a stimulus to illicit an adaptation, oftentimes this stimulus comes with an element of fatigue in the short term. As coaches and athletes we deal with this fatigue, manage it and employ best practice in our strive for performance gains. But, what do we do when competition is coming up and more load isn’t going to make us any better? – we employ and make use of the taper. Simply put a taper is the systematic reduction in the athlete’s training load during several days prior to the competition1. The methods in which you bring an athlete to peak performance can be divisive, in our opinion it is both an art and a science, so let’s focus on that science bit first! From “the science” standpoint the aim of tapering is to maximize physiological adaptation with reduction of accumulated fatigue2. In layman’s terms this means improving exercise performance by reducing the fatigue built up over previous phases of training. There are three variables we can play with here: frequency (how many sessions you do), intensity (how hard you train) and volume (how long you train for). 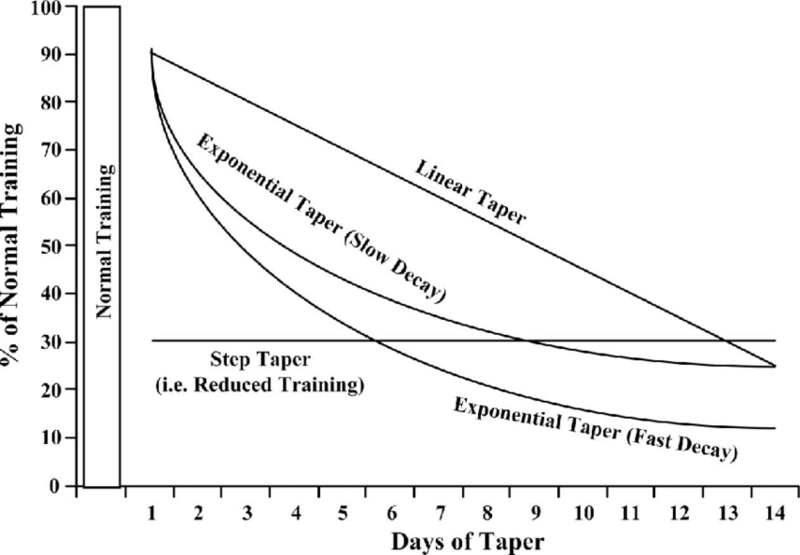 We can do this through a multitude of ways; Mujika and Padilla3 identify four types of taper patterns: linear taper, exponential taper with slow or fast decay of the training load and step taper. An illustration of this can be seen in figure 1. 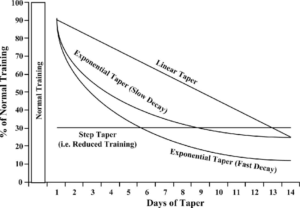 A linear taper and exponential taper are essentially both forms of progressively decreasing training load over time, the only difference being the rate at which that training load is reduced. A step taper involves an immediate decrease in training volume on the first day of the taper which is maintained over the whole duration. Figure 1. Types of Taper. Which form does the research lean toward? The general theme of studies within this domain seem to suggest that a progressive over a step taper is optimal i.e. decreasing training load progressively over time rather than straight from the offset. 8–14 days seems to represent the borderline between the positive influence of fatigue disappearance and the negative influence of detraining2. To progressively reduce this training load then we will need to manipulate one of the training variables outlined above, the consensus among multiple pieces of literature seems to be reducing the training volume and maintain the frequency and intensity. In reality it comes down to a multitude of factors on the athlete/ coach level which makes relying on the research hard. Issues such as non-functional overreaching (accumulated fatigue/ long-term performance decrement) are common in athletes and may negate the benefits of a taper4. What training the athlete has undertaken in the months prior to competition is also worth considering. Is a taper necessary if load has not been adequate to achieve the training response in the first place! Really this is where we branch into the “art” of coaching and knowing your athlete and your athlete’s needs. Is coaching an art? I think so but then again, I’m biased! What I do know is that listening to and communicating with the athlete you work with is key to bring about peak performance in whatever domain you operate. There has been limited research into how the tapering strategies above actually apply to real-life coaching1. Research that has looked into this domain suggests that, yes, coaches use these methods but in reality it is far from a straightforward process as the literature would lead us to believe. What Ritchie, Allen and Kirkland1 found in their research was that tapering was not restricted only to physiological outcomes but also psychological outcomes. Therefore, coaches in their sample involved athletes in the process, adapted the taper on an ongoing basis and continuously monitored its progress! We know the above cannot be truer in relation to real world training. We are not robots training in a simulation, so therefore the tapering process needs to be fluid and dynamic. Some examples would include working the day before your main competition for an amateur athlete, will this fit in with the taper? On the other hand, as endurance athletes we are often afraid to take our foot off the pedal in fear of losing our hard-earned gains – reassuring the athlete and adding intensity at the right time can combat this. 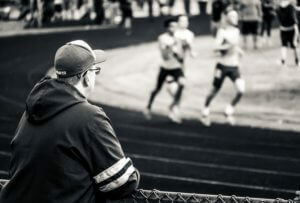 Some athletes will request to come into competition with a small amount of fatigue as they feel this is when they perform best, as a coach you need to respect their feeling and come up with a strategy. 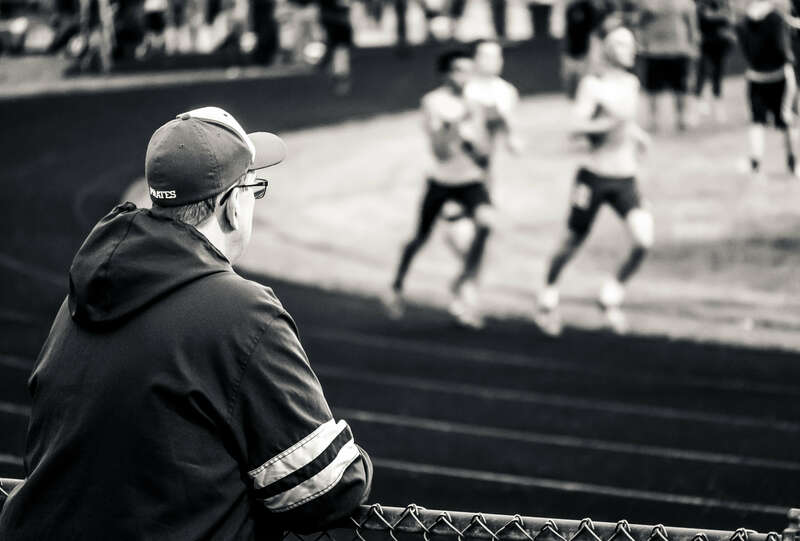 Some coaches will plan a taper a long way out in the best interest of the athlete, as an athlete you need to trust in the process and trust your coach while providing input to them on how you feel! Essentially this all comes down to communication. 1 Use the research to guide your practice, don’t be ruled by it. 2 In general a good place to start with a taper is by progressively reducing volume while maintaining frequency and intensity. How and when you do this is dependent on the athlete, training and competition. 3 Try out your taper in training first (on a micro level) e.g. taper into a testing day or a competition that you are not training for. 4 Use your relationship with the coach/ athlete to explain the process, explain how you are responding and ultimately learn from this. 1 Ritchie, D., Allen, J. B., & Kirkland, A. (2018). Where science meets practice: Olympic coaches’ crafting of the tapering process. Journal of sports sciences, 36(10), 1145-1154. 4 Murach, K., & Bagley, J. (2015). Less is more: the physiological basis for tapering in endurance, strength, and power athletes. Sports, 3(3), 209-218.